Clara Berta’s acrylic and mixed-media artworks blend texture and color to create harmony, mystery and depth on the painted surface. Many of the resulting shapes are irregular, vague, incomplete, overlapped, and transformed, free of traditional associations such as postmodern Abstract Expressionism or Conceptualism. 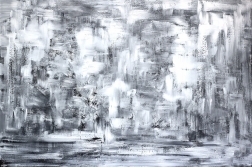 Artspace Warehouse Los Angeles has represented her dynamic artworks since 2011. Her richly layered works have been exhibited across the United States and collected internationally. 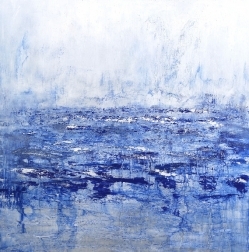 This one-of-a-kind painting in white and shades of blue is 60 inches square. It is wired and ready to hang. The sides are painted and it does not require framing. It is signed and titled by the artist on the back. Free local Los Angeles area delivery. Affordable Continental US and worldwide shipping. A certificate of authenticity issued by the gallery is included. Clara Berta is a passionate, award-winning, mixed-media artist of Hungarian heritage. 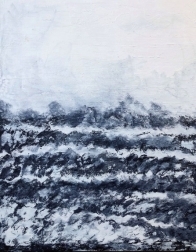 Her abstract mixed-media paintings explore themes such as the ebb and flow of memory, the significance of personal heritage, renewal, the passing of physical time, desire, passion, and love. Her abstract works often include reminders of her travels expressed in unexpected sequences of patterns as well as distortion of perspectives and subconscious spaces. Manipulating the texture with several layers of texture paste and acrylic paint, she will work and re-work her canvases, layering textures to give added dimension, and creating works that intrigue and invite the viewer to explore not only the surface but also the inner language of the painting. She explores the collision between the old and new, destruction and rebuilding lives. Her paintings underscore the awareness of the failures and shortcomings that are part of our lives. Her artworks are a language, a push forward in new directions and achievements, while always inspired by history. Berta mixes minimalism with underlying texture and embraces modernism while compiling the odds and ends of her attempts to let her art speak for itself.